The budget is the government’s Plan B, but what’s Plan C if polls stay bad? Scott Morrison addresses the media on Sunday. The government inoculated itself against the post-budget polls. Budgets don’t produce bounces, people said. True for the most part – though there were Newspoll bounces (three points or better) in 1996, 1999, 2000, 2009, and 2012. Nevertheless the fact that the first four post-2017 budget polls were all bad must have been a disappointment for Malcolm Turnbull. Newspoll and Fairfax-Ipsos on Monday both had the Coalition trailing Labor 47-53%; on Friday two ReachTEL polls, for Sky and Channel 7, had it behind 47-53% and 46-54% respectively. Given that polling has found that the main budget measures are in themselves popular – from which Turnbull appears to be taking heart – the government might have hoped for something better in the voting results. “Polls are not news,” Turnbull told a news conference on Monday, though he admitted to John Laws: “I do take notice of the polls naturally”. His throwaway “not news” line just invited a rerun of the clip from the day he challenged Tony Abbott, when he pointed to the Coalition losing 30 Newspolls on the trot. This week marks his loss of a dozen of them in a row. Accepting, however, that bounces are not the norm, the Coalition backbench will be holding its collective breath in coming months. Treasurer Scott Morrison said Australians will be absorbing the budget “over time”. From the government’s point of view, he’d better be right, and they will need to absorb it positively. If there is not a clawback for the Coalition later this year – and of course factors other than the budget will be feeding into public opinion – things will be looking pretty dire. Some predict Turnbull’s leadership will be in the frame unless the numbers improve; on the other hand, another change would be extremely hard. Budgets disappear quickly but not before an intense selling effort. On Monday night Morrison was mixing it at a Sky News forum on the New South Wales central coast, where the audience ranged from One Nation supporters and the party’s NSW senator Brian Burston to local Labor MP Liesl Tesch, who scored a question. 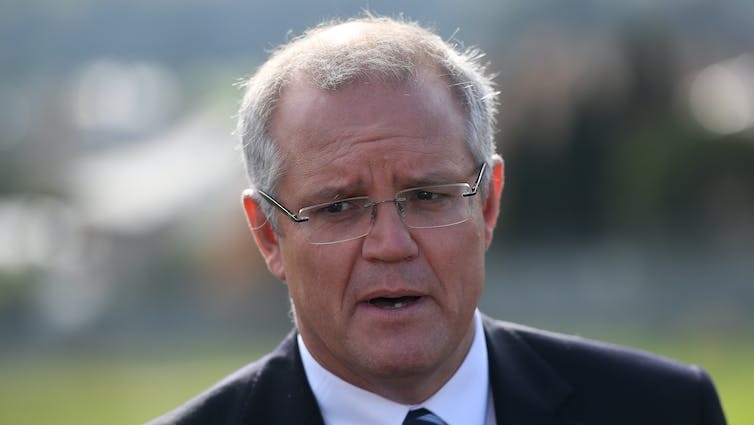 Morrison was tackled on debt, housing (at length), the banks, immigration and identity politics. A woman bluntly told him his reference to “mum and dad investors” in the property market was “ludicrous – they are all investors”. A man who described himself as editorial cartoonist to Mark Latham’s Outsiders declared the government had shifted too far to the left and wanted to know “when we’ll get the government we voted for”. As he’s done in and since the budget, Morrison stressed eschewing ideology and just “getting things done”. The Liberals believed in investing in education and sustainable services, he said; the difference between a Liberal and Labor budget was “the Liberal budget is paid for”. Morrison reiterated that the banks should absorb the levy the budget has placed on them. The audience thought it would be passed on – something Turnbull admitted earlier in the day the government could not actually stop, although “there are plenty of factors that will inhibit them from doing so”. For those watching the Liberal Party’s internals, one of the notable reaction to the budget has been Abbott’s. Given that, at its core, the 2017 budget is about trashing the remnants of the 2014 Abbott-Hockey effort, one might have expected him to be much more critical, though his words have had an edge. In contrast, his former chief-of-staff, Peta Credlin, has been bitterly critical, saying on Sky “the budget is about the Liberal Party junking everything that it has stood for”. One assumes Abbott’s views are much stronger than he is expressing. So why is he being careful, when often he’s anything but? Credlin said she thought “he’s trying hard not to be accused … of fuelling an anti-Malcolm sentiment”. If those polls don’t turn around, Abbott doesn’t want people being able to point fingers of blame at him. He’d been keen for all the responsibility to be squarely on the shoulders of the prime minister and his treasurer. The government has been candidly admitting that this budget, so out of character for a Coalition government, is not its preferred choice. In other words, it is Plan B. But if Plan B doesn’t help do the trick with the polls, it is not clear what Plan C would be.